Cross-country and back on a 2012 Ural Patrol in the hottest part of the year with two dogs in 17 days? More than 5,000 miles and an international border crossing? Time constraints? Maintenance intervals? And side trips to visit family? So begins our test trip driving our new Ural and an F650GS cross-country from Boston to Colorado, carrying our two dogs. If all goes well on this trip, planning for a RTW will kick into high gear! 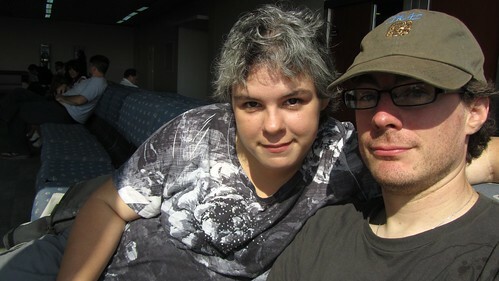 When our Americas trip was almost over, we were ready for a break from the road. Believe it or not, sleeping in a different place every day, riding 300+ miles everyday and seeing a host of extraordinary sights can actually wear on a body. We traveled 18,000 miles in 114 days, with only 18 rest days – and most of those were spent repairing motorcycles or recovering from being ill. So we were ready to head home at the end of our trip. Fortunately (or unfortunately, as the case may be) we only needed a few weeks to recover at home before we began to miss the rhythm of being on the road. Wake up, ride through beautiful landscapes until you get tired, take a break, ride some more, check out whatever cool stuff catches your fancy, and then stop whenever you get tired of riding for the day – or when dark finds you, whichever comes first. It’s hard to adjust to a corporate job and life in a cubicle after 114 days of that kind of freedom. So it wasn’t long before we were talking about being on the road again. Next time – the world! Something about Mongolia just caught and held our attention. And of course, there’s a whole world out there to explore – we’d enjoy getting to Mongolia however we routed our trip! Tentative planning for a RTW began, but there was one problem… what would we do with the dogs? When we returned home from our Americas trip, we discovered that Kay’s dog was much changed. He was no longer the happy-go-lucky canine who ran up to greet everyone in the park. He was stiff and snappish with strangers, and a year of canine therapy has only partially rehabilitated him. After that experience in leaving our dogs with dog-sitters, I was unwilling to leave them behind again. They had to come with us. We looked at various options. Tow trailers behind the F650s like some of the bicycle trailers for kids. Rig up some kind of sidecars for the F650s. For a brief period, we were enamored with the idea of taking Stella scooters with sidecars – they fit our criteria for a ridiculous vehicle and would have been a lot of fun, but Kay has major issues with the Stella’s shifter. Or… maybe we could buy a production sidecar motorcycle? Maybe a Ural? We began casually shopping our local Ural dealer. And then we began more than casually considering the idea. The Ural requires FAR more frequent maintenance intervals than our F650s – like every 1,500 miles, which on our Americas trip was about every 5 days… and obviously that was a turn off. Who wants to stop and deal with changing fluids and doing other maintenance so often? But we kept coming back to the Ural. The Ural sidecar seemed roomy enough to hold both dogs – if we went with a Stella and a sidecar hack, we’d need two of them to carry both dogs. And with two dogs, would we really be traveling at a particularly fast pace anyway? They’d need frequent rest stops, and we want to do our next RTW at our own pace, with no deadlines, so we could handle doing shorter mileage per day with more frequent rest days. The Ural began to seem like an option that might actually be compatible with our travel style. I started lurking on Soviet Steeds, reading everything I could about the Ural’s “known issues,” maintenance requirements and how people generally feel about their beasties. Whatever their faults (of which there seem to be varying degrees, depending on who’s speaking, from the Russian metallurgy to the inability to travel at more than 65MPH) most Ural owners tend to speak very highly of their bikes. These bikes, more than many others I’ve read about, really seem to inspire a lot of love and affection. There was something alluring about the way people seemed to speak of their Urals. It drew me. I looked into other sidecar options, including custom hacks for the F650 or other bikes… but the Ural was there with her siren call. The Ural didn’t require an endless and expensive series of tweaks to get the setup and handling just right. It was made to drive a sidecar. It had awesome features, like 2WD (which we think would be very handy in places like Mongolia, where only something like 4% of roads are paved) and a reverse gear. And if we bought a new one, we’d have the advantage of the Ural warranty – 2 years and unlimited miles. More and more attractive. After a final trip shopping at our local Ural dealer, we decided to pull the trigger. (At this point, we had still never driven a sidecar rig, or a Ural – the dealer does offer test rides, but every time we were there that wasn’t an option due to various things.) We had no idea if we’d like a sidecar bike, or the Ural in particular, but we took a leap of faith and decided that THIS would be our beast for the RTW trip. We didn’t even know if the dogs would take to riding in a sidecar. This was to be an expensive gamble. We placed our order in March for a 2012 Ural Patrol in Blue and White, and after completing a sidecar training course, we took delivery of our new rig at the beginning of May. After a few initial mechanical hurdles, our relationship with the Ural seems to have settled into a comfortable place. It’s a lot of fun to drive, but a lot more work than a two-wheeler. And happily, the dogs have really taken to riding in it! We’ve done many day trips and local rides, a few weekend camping trips… and now is our first big test trip with the dogs in the Ural. If this goes well, we’ll green-light the RTW – hopefully for next year! We leave Boston on Thursday, July 19. We’re heading for Colorado, to Lake Granby, for a rally with our other motorcycle tribe – the F650 folks from the Chain Gang. We’re hoping to hit Colorado in a week of travel, bum around for a few days at the rally, and then head back across a different route that takes us into Canada and back home. We’ll be traveling through 17 or 18 states, depending on how we go, and the Canadian province of Ontario, in 17 days. 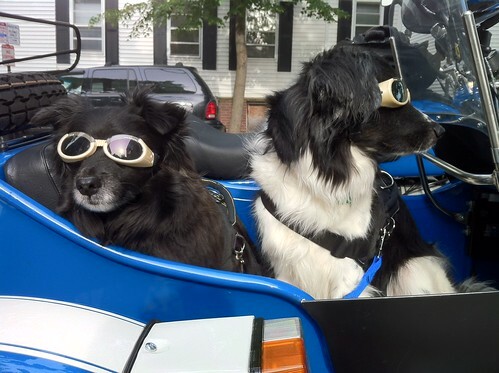 And we’ll be doing it with two dogs on a barely-broken-in 2012 Ural Patrol (we’ve just hit 2,500km!) and my reliable F650GS, now with around 29,000 miles on the clock. Sounds like a pretty awesome vacation to us. And maybe we’ll find some adventure along the way.